... 1936, Marianne Hainisch (right) died in Vienna at age 97. She'd married an industrialist at age 18 and borne 2 children by the time she was 22. (photo credit) Struck by an educated friend's difficulty in finding work after her husband got sick, publicly insisted that Vienna start schools for girls -- a demand that bore fruit when a bank donated money for such a school. She wrote numerous articles and books on women's issues. Hainisch subsequently founded or cofounded the League for Extended Women's Education, the Federation of Austrian Women's Organisations, and the Austrian Women's Party, and she also served as Honorary Vice-President of the International Council of Women. 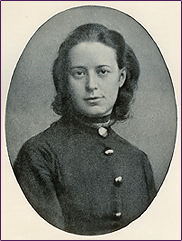 Along with Baroness Bertha von Suttner, who also lived in what was then the Austro-Hungarian Empire, Hainisch was active in the early 20th C. peace movement. Having also spearheaded the observance of Mother's Day in Austria, Hainisch herself was the mother of that country's 1st President.